Nobody seems to have much detail about the Senate negotiations that produced a deal that gives so much offense to House Republicans. But it seems pretty clear that Senate Republican leader Mitch McConnell left town thinking it was all copacetic with House Speaker John Boehner. Now Boehner says the deal is reprehensible because it only extends the payroll tax cut for two months. Boehner would like you to think this is the Democrats' fault, but quite clearly his (newly-acquired) disagreement is with the Senate Republicans. It's been reported that the Senate negotiators extended the payroll tax-cut extension only two months because Democrats and Republicans couldn't agree on offsets. But surely the larger problem was that the Senate Republicans, and especially Senate Republican whip John Kyl, don't want to extend the payroll tax cut at all. Kyl has said so publicly, and when Senate Republican leader Mitch McConnell introduced a GOP alternative to the Obama payroll tax-cut plan--a plan that did not include the millionaire surtax that Republicans can't abide because it victimizes "job creators"--this GOP compromise failed to win not only a majority of Republican votes but also most of the votes within the Republican leadership. Twice. So it's reasonable to think that the only reason Senate Democratic leader Harry Reid could get only a two-month extension of the payroll-tax cut, when President Obama had been pressing for a full year, was because that was all Senate Republicans were willing to give, and that they were only willing to give that much if President Obama swallowed a provision pressing him to make a quick decision on the Keystone XL pipeline, which previously he'd branded veto bait. Obama swallowed it, a deal was cut, and the Senate went home. House Republicans now feel they've been mousetrapped into accepting a deal that will give Obama the opportunity to beat up on Republicans if they don't agree to extend the payroll tax cut. And that does appear to be true. But a two-month deal is not what the Democrats wanted. They wanted a deal for a full year. They still want that, and Reid says he's happy to negotiate one when everybody gets back from Christmas break. To get it, the Democrats will probably have to give up something else to the Republicans. That's good for Republicans and bad for Democrats. But House Republicans insist on believing that they're getting screwed. They claim that almost everything in their bill has been accepted by the Obama White House. David Rogers of Politico has demonstrated that claim to be false even before you take into account the House GOP's grotesque "you're too stupid to get unemployment benefits" reform of unemployment insurance. The truth is that the Democrats have already given up too much to extend the payroll tax cut, and the GOP still can't give it to them, because it's at war with itself over whether it can stomach tax breaks that don't go to the rich. I don't really see how obstructing the payroll tax cut extension helps the GOP even with its nut-bar Tea Party constituency. 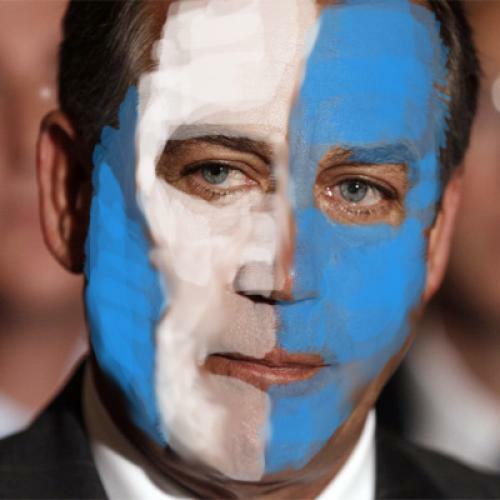 But it seems determined to go the way of William Wallace, shouting "Freedom!" before the axe falls. Update, 8:20 p.m.: Sam Stein reported yesterday in the Huffington Post that before the House GOP was against a two-month payroll-tax cut it was for it. The 56 House GOP supporters for the Jan. 2009 bill, which called for a complete payroll-tax holiday for two months, included some of the most conservative members of Congress, among them Michele Bachmann. So apparently it isn't just the Senate GOP vs. the House GOP. It's the House GOP versus itself. Sort of like William Wallace being against Scottish independence and then deciding on a whim to be for it.